With blue sea, white sandy beach as backdrop the new airport aims to provide passengers with a unique and memorable travel experience. All passengers arrive and leave the airport by boats. As a single level facility the new terminal is both convenient and easy to use. The modular terminal structure is designed for flexibility to grow according to traffic demand. Its north facing shell-form roofs, made of timber lattice supported on laminated timber arches to evoke the architectural vernacular of the area, brings in abundance of natural light. Passengers move through the building via covered bridges spanning over water, beaches and wait in lounges nestled amongst palm trees. The building has 50% of its area outdoor on decking for passengers to witness the rich marine life at sea level. Together with the use of natural ventilation, effective solar shading and hydro-thermal cooling this strategy greatly reduces the need for full air-conditioning. The ecologically sensitive design ensures that this will be one of the most energy efficient and environmentally sustainable terminal buildings in the world. Aviaplan/Narud Stokke Wiig from Oslo, in collaboration with London-based Haptic Architects have developed a strategy for a new international airport in the Maldives. 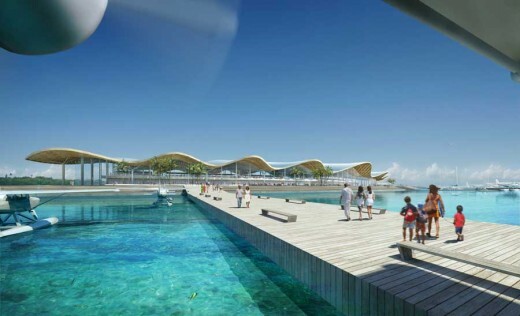 The new airport embraces Maldivian culture and the natural setting through preservation of the island’s coastline and in the selection of natural materials. Whilst the airside facilities and runway are located on the island, the terminal building is located within the lagoon, connected via a sweeping bridge. Natural forms have provided inspiration for the architecture, with a primary move being a sweeping, undulating roof that makes a dramatic statement and creates a sense of arrival for visitors. The roof, formed as a timber diagrid structure is juxtaposed with a simple glass enclosure, which provides uninterrupted views of the lagoon and island. In plan, all visitor and staff facilities are located centrally to free up the perimeter for seating and circulation. The internal environment, in terms of architectural treatment, natural lighting and passenger well-being was felt to be as important as the arrival and departure sequence, from seaplane through to plane. North facing roof apertures provide suitable lighting conditions whilst minimize solar gain. The timber diagrid is complimented by a lighter timber soffit to reflect natural light and tie in with the timber flooring, which is installed throughout the terminal building and the external spaces. 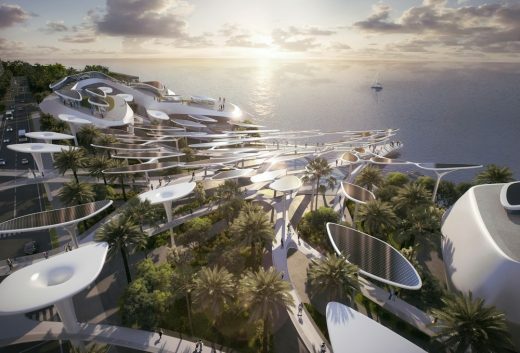 Unlike many airports throughout the world, this proposal seeks to improve the visual and physical connections between inside and outside spaces, providing generous space for relaxation and dining; allowing one to enjoy the island’s beauty to the last possible minute! The terminal employs several passive design measures, from north facing rooflights and large roof overhangs to minimise solar gain, to rainwater harvesting and roof mounted photovoltaics.